I recently rediscovered a fuzzy gray photograph that has been in a well-worn old family album for as long as I can remember. The brown album cover is broken and the old black and white pictures are no longer held in place on the black paper pages by the little black corner stickers that now fall out when you turn the pages. As a little girl I spent hours studying the family photo collection, but this picture is one I never paid much attention. It shows some soldiers’ backs and shoulders. They are looking out toward the water and you can see the front half of a war ship in the background. There is also a tiny boat in the distance. Farther out there’s something else that seems to be the focus of the soldiers. How did I miss the significance of this fuzzy gray photo all these years? The object in the distance is the Statue of Liberty! My veteran Dad took the picture in 1946. It was his first glimpse of America after almost a year in Europe. Soldiers crowded shoulder to shoulder at the rail of the ship to gaze at Lady Liberty and cheer with excitement that they were almost home. Even though he went to gunnery school and was trained to drop bombs from airplanes, my Dad never saw combat. His crew had already been given orders for Europe when the war ended so their assignment changed. They flew a plane that had been fitted with cameras and instead of dropping bombs they took aerial photographs. But of all the miles of film my dad exposed, I doubt there’s a single picture more significant than the one of New York Harbor in 1946. How many soldiers saw this same view on their trip back to the United States? A whole generation was called to duty. They went, they served, they fought, and some came home. They came back different from when they left. Farm boys and small town boys had seen parts of the world they’d never imagined outside of history books. They came back men: seasoned, experienced, and ready to take their place in the world. Some had seen blood and death and their first glimpse of America at the end of their tour was the symbol of the freedom they had been fighting for. A fuzzy, gray photo just three inches by two inches—easy to overlook, easy to forget. Yet today it gives me chills. He is 85 years old now, but my Dad can still tell stories about the places he went and the things he saw during World War II. 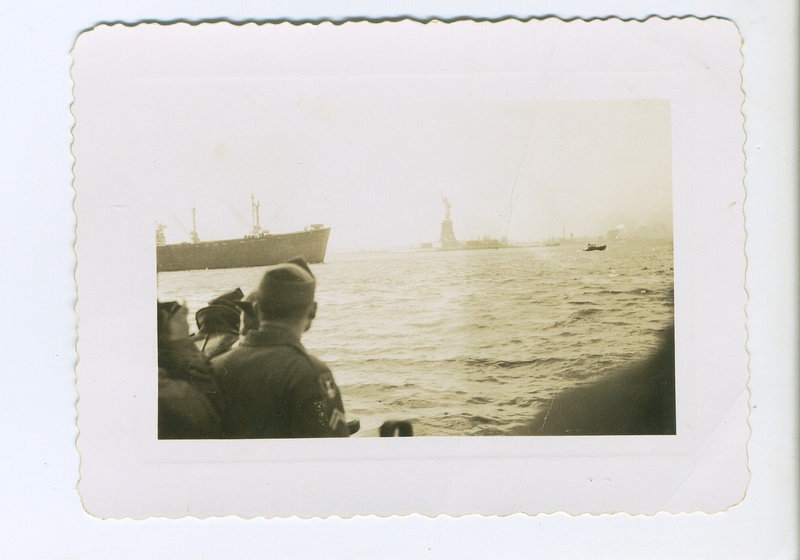 And more than 60 years later, he remembers the thrill of seeing Lady Liberty from the bow of the ship headed home. This year when I see the fireworks on the Fourth of July I’ll be thinking about that fuzzy gray photo and all the joy and thankfulness it represents: freedom and life worth celebrating. This entry was posted in Uncategorized and tagged Album cover, Independence Day (United States), Karen Estes Lowry, liberty, New York Harbor, patriotism, Photograph, Raymond Estes, Soldier, Statue of Liberty, United States, World War II. Bookmark the permalink.